It’s not often a state agency completely changes the way it does things. Yet that’s what has happened, thanks to manager Peter Oshiro and his team of inspectors in the Department of Health’s (DOH) sanitation branch. Now customers can check for color-coded placards at Hawai‘i’s 10,500 restaurants, food trucks, grocery stores, schools and other facilities. 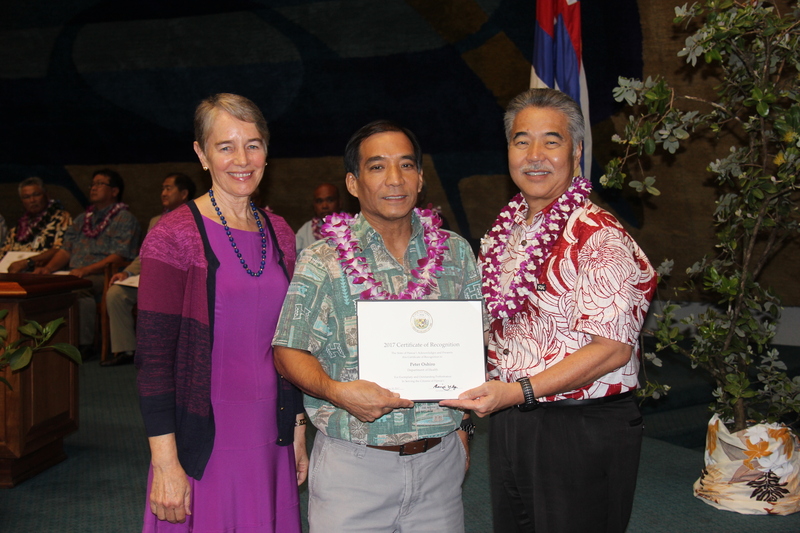 “The system has worked well because we enforce through education,” said Oshiro, who was DOH’s nominee for outstanding manager of the year. A green “pass” placard means no more than one major food safety violation was found and corrected on site. A yellow “conditional pass” means two or more major food safety violations were found, or a single violation couldn’t be corrected at the time of the inspection. A red or “closed” placard means there’s an imminent health hazard that results in a restaurant’s permit being suspended or the restaurant was unable to correct the violations within the time frame allowed. DOH’s latest innovation is an online portal at hi.healthinspections.us/hawaii/ launched in 2016 where the public can read inspection reports for Hawai‘i restaurants. Currently, the site covers only O‘ahu establishments, but Oshiro said the goal is to include neighbor island restaurants by the end of this year. “Transparency through the placards and the public website is there for the whole world to see. That has a powerful effect in influencing industry behavior,” he maintained.